Our callsign was N4Y. 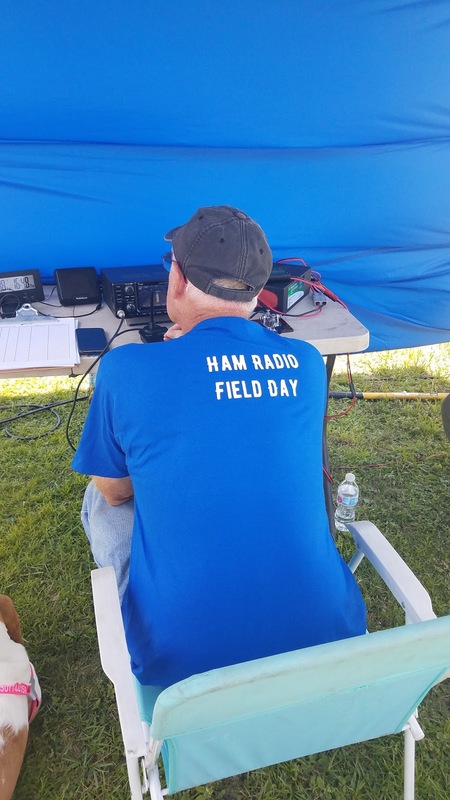 Field Day this year was a two operator, one transmitter operation on emergency power. Our exchange was "One Bravo Northern Florida." Dennis WA6QKN and Greg N4KGL were the operators. 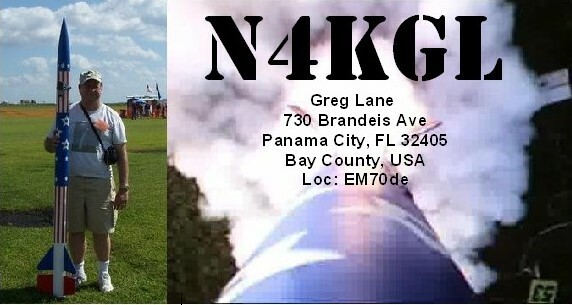 The venue was Kinsaul Park in Lynn Haven, Florida. It had plenty of space for antennas. We could not stay past the 10 pm park close. 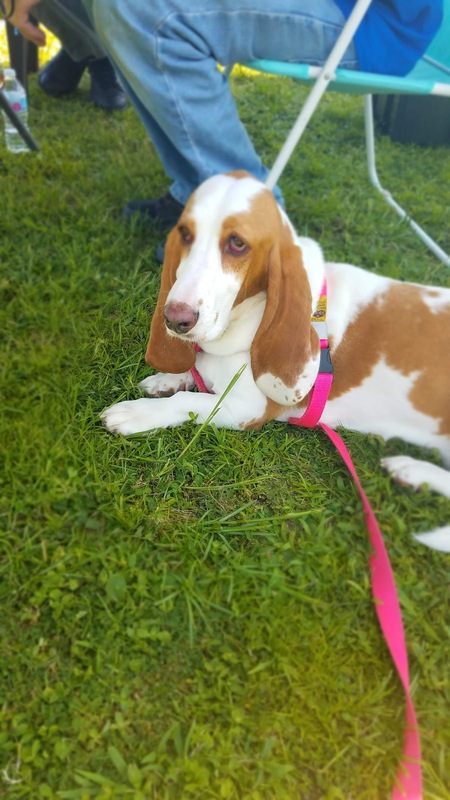 We resumed on Sunday morning until the end of Field Day. This was just as well as we were attacked by No-See-Ums after dark Saturday. We started early Saturday morning. 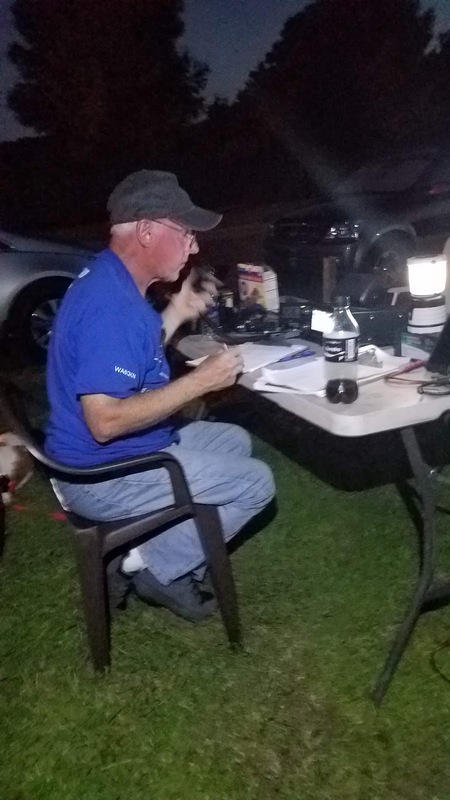 There was some drama as the medical alert service called and said they were dispatching EMS to my Mother's house in Dothan seventy miles away. It took about forty minutes to find out it was not a medical emergency. My Mother stepped out on the back porch and the door locked behind her. So Field Day was on after all. 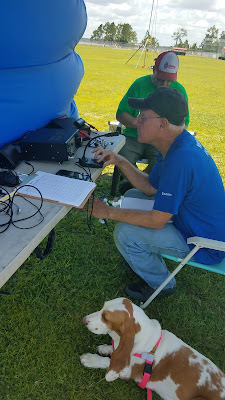 Dennis and I, with help from Phil N4STC, erected a 272 foot 80 meter one wavelength square horizontal loop. It was fed in the center of the South wire. We tried a 4 to 1 and 2.5 to 1 balun. The 4 to 1 had the best SWR. 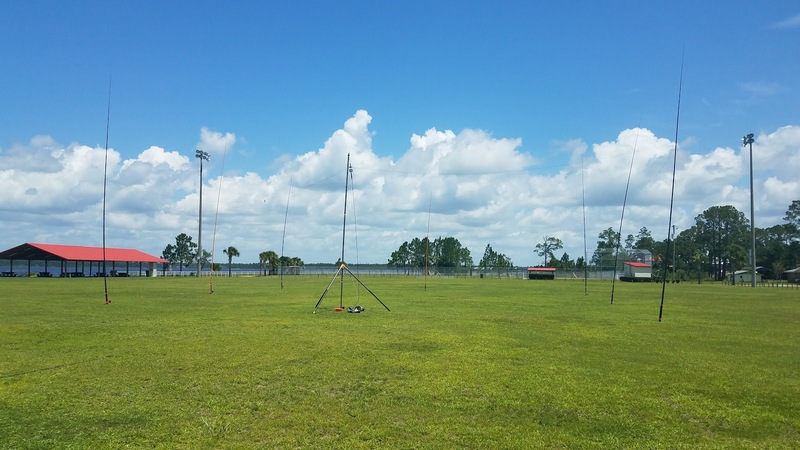 It had a low of 1.9 on 80 meters and between 2 to 1 and 3 to 1 on the rest of the band. 40 meters and 20 meters were under 2 to 1 for the most part. The 2.5 to 1 balun had worse SWR than it previously had when feeding the loop at the corner. The 80-meter one wavelength horizontal loop. Our second antenna was the myantennas.com 80-10 1K Endfed which is 130 feet long. We oriented it on an East-West line at 20 feet up. The SWR was a little high on 80 meters but OK on the other bands. I was not disappointed with the loop, but the end-fed did the job as well, we think. On Sunday, we went with the end-fed alone on a North-South line. It served us well even on 15 and 10 meters which opened up Sunday morning. The rig was the Icom 7300 powered by a 40 amp-hour Bioenno LiFePO4 battery. 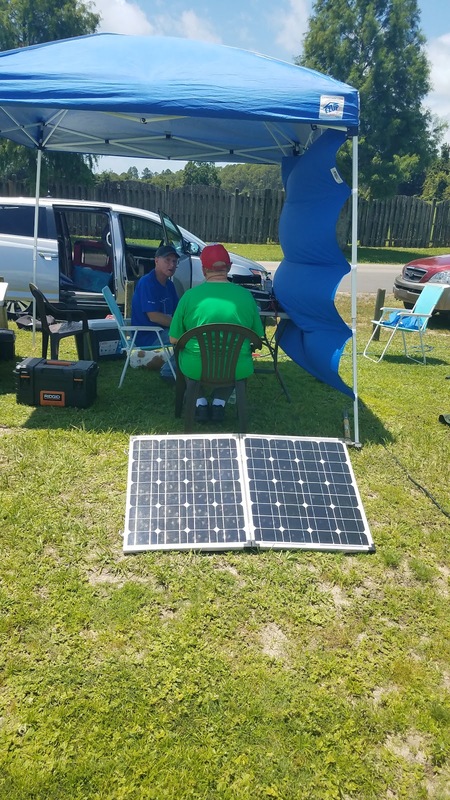 The battery was on a 50-watt solar panel and the Sun was out all day. It turns out the battery voltage was higher at the end of the day than the beginning. So the power we consumed was replenished by the solar panel. The Icom 7300 is a pleasure to use. I walked down the band making CW contacts with the spectrum scope. I used a 50 Hz filter to hear just one station at a time. Dennis did a fine job on the phone mode. On Sunday, he worked a fifty station string on 15 meters. At the end, we tried our hand on PSK-31 on 10 meters. We got the hang of it and could do more next Field Day. I attempted using the FM satellites with no success. I never got going with the linear sats. I did pull off five natural power contacts using a solar panel and a 58 Farad supercapacitor for 100 bonus points. We did have ham visitors and curious park-goers. One visitor was enthusiastic about getting his license. I used the rocket club trailer for hauling the gear. It had six water type fire extinguishers which puzzled the visitors. Suzy did her best job doing the meet and greet. No one went away disappointed. In the end, we made 180 contacts, 109 on phone, 57 on CW and 14 on digital. I believe we have some momentum going. We plan to have a big multi-operator, multi-transmitter Winter Field Day camp-out in Falling Waters State Park at the end of January. The enormity and enthusiasm for Field Day across the country, remind me that Ham Radio is doing well and has lots to offer on a social, technical, and service perspective.